We arrived in Vancouver at 7.00am – drizzling rain. After breakfast, it was time to leave our cruise ship and board the coach with our guide Rica and Anthony our driver for a short tour around the city. We went through Gastown, the original settlement that became the core of the creation of Vancouver in the 1870’s. A tourist attraction is Gastown’s most famous landmark is the steam-powered clock on the corner of Cambie and Water Street. It was built in 1977 by horologist Raymond Saunders and metalwork specialist Doug Smith. Incorporating a steam engine and electric motors, the clock displays the time on four faces. The steam also powers the clock’s sound production, with whistles being used instead of bells to produce the Westminster “chime” and to signal the time every quarter of an hour. The clock produces a puff of steam from its top on the hour. As we were on the coach, we did not hear the sounds but saw a puff of steam as we passed by. We then made our way via Chinatown to Stanley Park , Vancouver’s first and largest urban park. The 400-hectare natural West Coast rainforest with scenic views of water, mountains, sky, cultural and historical landmarks and majestic trees along the Park’s Seawall. It also includes Canada’s largest aquarium. As we drove around the Park, we saw the statue of the “Girl in a Wetsuit”. This statue was a gift to the Vancouver Park Board from sculptor Elek Imredy. 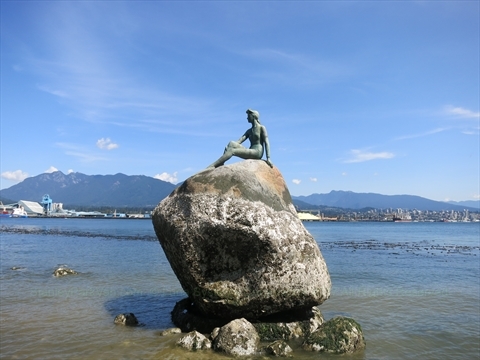 Unveiled June 10, 1972, she represents Vancouver’s dependence on the sea. We had a short stop at the Totem Poles at Brockton Point in the Park. These towering monuments are brought to life through First Nations artistry and are one of the most recognisable cultural symbols of Western Canada. One of the Totem Poles was raised in 2009 and created to Rose Cole Yelton, her family and all those who lived in Stanley Park. This pole is erected in front of the house site where the Cole family lived until 1935. Until the time of her passing in 2002, Rose was the last surviving resident of the Brockton Community. It was time for our great tour with Tripadeal to end with most of the group transferring to the Vancouver International Airport. I want to thank Gayle/Dianne, Kay/Phil, Gail/ Russell, Sal/Russell, Carolyn/ Rob, Andy/ Vincent, Marilyn/Paul, Kay/Jeff, Dianne/Ken, Rhonda, Joe, and Danielle, Lynda/Stephen, Maureen/Steve, Sandy and Peter for making this tour as enjoyable as it was for me. I really appreciated your assistance you all offered me when needed. We certainly had lots of laughs. Hope you all stay well and healthy and that we stay in touch now and again down the track. I stayed at the airport until 6.00pm with Sandy, Peter, Maureen and Steve as their flights were not going until late that night. I then caught a cab to my accommodation at the Accent Inn. I had dinner next door at the Ihop restaurant and then came back to my room and contacted Bob about taking him up on his and Cheryl’s kind offer for me to stay with them on Vancouver Island for the week. Guess they didn’t think we would see each other so soon!! Had an early night. Was very quiet being by myself after having companions for the last fortnight. Got up later today and it was quite cold and misty – not much to see as we sailed so spent most of the day was spent chatting, snacking and coffees. The food was amazing – some very creative and the chefs obviously enjoyed showing off their talents. There were so many different eating places one could go to – would be hard to please if one couldn’t find something to their liking. Was thinking I had to think of a plan B as heard that hurricanes were moving into Florida and I was planning to fly down there on Saturday. While talking to a regular “chatting person”, Bob, he said if I needed I could stay with he and wife Cheryl on Vancouver Island. Didn’t get to see a lot of Cheryl as she was quite ill and spent a lot of time in their cabin. What a shame. Did the majority of my packing and in the afternoon had my last dip in the hot tub before it was time to change to go down for the group’s “happy hour”. I got such a surprise as when I arrived, several of the group had their cabin robes (ball gowns) on and they insisted I go back and don mine. Of course, I made my grand entrance! We had a lot of fun and I thought this was a lovely thing to do with me as I was in my robe a lot of the time while on the cruise. There was lots of joking, drinking, hugging and laughing before it was time we all changed for our last dinner on the ship. My grand entrance for the ball?? Wouldn’t let me take the whole bottle ! Some fun on the steps – 2 Russells, 2 Di’s, Gayle Sal and Gail – No, I didn’t fall down! Listened to Ged Parker, a guitarist for a little while before I went into the Metropolitan Restaurant for dinner and sat with Gayle, Dianne, Andy and his brother Vincent. After dinner heard the Forster Duo perform before it was back into my cabin and finished packing then bed reasonably early. Was a beautiful sunrise as we cruised to Ketchikan – squeezed between mountains and sea, it is hard to imagine how the town got the Tlingit Indian name – Ketchikan – “Thundering Wings of an Eagle”. If one climbs the 3,000 foot Deer Mountain that overlooks the town – from that vantage point Ketchikan sprawls out in the perfect shape of an eagle in flight! Like most communities in southeastern Alaska, Ketchikan is surrounded by a vast wilderness and impassable mountains. Without road or rail connections to the rest of North America, everything must come by air or sea. Ketchikan is a small, picturesque, rustic and busy town on the shores of the Tongass Narrows. It also has the distinction of having the world’s largest collection of totem poles. Unfortunately, I did not have time to see the collection. We docked in Ketchikan on the western side of Revillagigedo Island at about 1.30pm. I went down to see Ashley (who gave an interesting presentation on jewellery yesterday) as the jewellery set I had purchased in Juneau had a fault. Hoped she would be able to sort something out for me. I then went up the town for a short time until it was time to come back to the pier by 2.15pm to board a bus and go to George Inlet Lodge for our crab feast. Eat all you can! We came into the George Inlet Lodge and our hostess demonstrated how to shell a crab. I was spoilt as no way would I have been able to manage because of my fractured wrist so I was brought two bowls of all ready shelled crab. It was delicious. We had a nice entree, the crab and then concluded with cheesecake and coffee. It was then time to board our floatplane. Boarding the Taquan Air 10 seater plane – oops sorry forgot the pilots name ! Ketchikan – see our ship? What a wonderful flight seeing so many lakes/fjiords, waterfalls and snow still on some of the rugged mountains. Headed back to Ketchikan and was quite exciting landing on the water. A bus took us back to the main street of Ketchikan and I did some last minute shopping before it was time to wander back onto the ship by 7.30pm. On my way back, passed Dave Rubin’s bronze monument “The Rock” that was unveiled at Berth 1 on Sunday, July 4th, 2010. It features 7 life-size figures from Ketchikan’s past: Chief Johnson, a logger, a fisherman, a miner, bush pilot, a Native woman drumming, and an elegant lady in her 1890s finery. Had good news from Ashley as she was able to get me a replacement jewellery set. Didn’t feel like much for dinner tonight after the crab feast so just had some nibbles. We sailed out of Ketchikan at 8.30pm. This was another very enjoyable day. We cruised during the night and sailed into the Gastineau Channel. At 7.15am we arrived in Juneau, the capital of Alaska founded during a gold rush in 1880. It is the home of the Tlingit tribe. Juneau is deep within the northern reaches of the Inside Passage and is accessible only by air or sea. Juneau is nestled at the foot of Mt. Juneau in the Alaska Panhandle – it faces the water from the mainland side of Gastineau Channel. The current population of Juneau is approximately 32,000 and their economy is based on government, tourism, mining and fishing. After breakfast and after our ship had been cleared by local authorities, Lynda and I spent some time visiting some jewellery stores and collected some freebies offered by some of the merchants. This was a way of seeing whether we would purchase their wares. Was fun trying on some of the very expensive and beautiful necklaces. We didn’t have a lot of time as we booked our excursion with the huskies. After a short bus ride to the rainforest, we met Robert Redington, our musher and his team of 16 sled huskies and 6 of us climbed into a custom designed wheeled summertime sled and set off through the lush rainforest at an almighty pace. The dogs negotiated the left and right handed corners with such speed Lynda and I thought the sled may have overturned. We had a couple of stops along the way to give the dogs a breather and to pat them. We then went onto our next stop at a suspension bridge over Fish Creek. We then heard some information by Gareth about the Alaskan equipment, dog care, training and efforts required by this sport and special mention was given to Robert’s grandfather, Joe Redington (born 1 February 1917) is best known as the “Father of the Iditarod Trail Sled Dog Race” for his work promoting the race. It is a gruelling long distance sled dog race run annually on the first Saturday of March each year from the Anchorage area to Nome. 2017 saw the 45th event and about 70 participants take place. The race has drawn attention to the role dogs played in Alaska’s history and around the world. Joe has competed in 17 Iditarods from 1974 to 1997, but never placed higher than fifth. Was amazed to hear that he finished 5th place at the age of 72. He was the honorary musher in the 1997 race, as he was 80 years old when he completed the race. Joe also organised and ran 5 Iditarod Challenges, a guided trip to Nome for paying clients, 1993-1997. Joe died on 24 June 1999 from cancer and was buried in his favourite dog sled in Wasilla, Alaska. What an incredible man!!!! Robert has signed up for the 2018 Iditarod race and we wished him well. Our exciting and exhilarating sled ride ended at a refreshment stop and to see and cuddle some 6 week old little puppies. So cute but they wouldn’t let us take any with us. We were then driven back to main town Juneau. Lynda and I had some lunch while we waited for Lynda’s Steve to arrive and then I said goodbye and went at 2.15pm and joined a group for my next excursion. We boarded a bus and had a short drive down town of Juneau before we headed over to Douglas Island and had a photo stop at Homestead Park looking over towards where our ship was berthed. Laurie was our guide. It was then onto the Goldbelt Mount Roberts Tramway (cable car) for a very smooth 1800 foot ascent and see wonderful views of Juneau, Douglas Island, Gastineau Channel and the Chilkat Mountains. After some of the group did a short trek, we went into a lovely little Tea House where we sampled three varieties of tea and tasted the accompanying home made jellies on crackers. Before we left, Laurie mentioned that a 13yr old Benny Benson (October 12, 1913 – July 2, 1972) won a contest in 1927 when he designed the flag of Alaska. Alaska became the 49th state of USA in 1959. Laurie then very proudly sang a song about Alaska’s flag before we then said goodbye to her as that was the end of the tour. As there was quite a long queue for the tram, I did not linger up on the mountain but made my way down and spent some time in some of the stores in the town before it was time to join the ship. After doing some last minute souvenir shopping, I was quite exhausted when I got into my cabin. I took something to eat back to my room tonight. We slipped out of Juneau at about 8.00pm. This was a fabulous day – doing the sled ride with the huskies was thoroughly enjoyable and something I probably will never be able to do again. Today we are at sea – more relaxing. After breakfast was in my “ball gown” ready for another session up on 10th deck – chatting, in the hot tub. About 8.15am we will be entering Yakutat Bay and arrive to the most permissible point possible off the Hubbard Glacier. This glacier is the largest tidewater glacier on the North American continent. It is located in the U.S. state of Alaska and also in Canada’s Yukon Territory. Standing at 11,000 feet above sea level, the glacier stretches 76 miles from its source in the Yukon to the sea at Yakutat Bay and Disenchantment Bay. It is the longest tidewater glacier in Alaska, with an open calving face over 6 miles wide. Calving is when chunks of ice break off at the terminus, or end, of a glacier. Ice breaks because the forward motion of a glacier makes the terminus unstable. We call these resulting chunks of ice “icebergs.” The ship did a complete circle so as all passengers could see both sides. Certainly a spectacular sight being as close as we were to the Glacier. At 12.oo I went to a Diamond and Gemstone Seminar and met Ashley who was the presenter. She was very knowledgeable. More relaxation until 5.00pm and went to hear naturalist, Milos Radakovich discuss the powers that shaped Alaska, volcanos, glaciers and the building of continents and oceans. This was a well presented seminar and fascinating to see how the continents split apart. How the continents separated ! I didn’t get to see the dinner group tonight so there was only me at the table. I ordered 4 delicious entrees (chilled shrimp cocktail, baked french onion soup, grilled asparagus salad and duck terrine) and a tiramasu. This sounded a lot, but was just the right amount as I found that the main meals were too much if I wanted a dessert and of course I did. Enjoyed a cocktail while I listened to the end of the Forster Duo once more and then to bed. Woke up to a nicer day than yesterday as far as the weather was concerned. I was dressed in my swimmers and the ship’s robe (“my ball gown”) and this became a joke among my fellow passengers. Had breakfast with Kay, Phil, Gail, Russell, Sal and Russell and then I was into the hot tub. I spent as much time as I could up on the 10th deck so won’t mention every time I go in. Was a good meeting place – many hours were spent with Joe, Rhonda, Danielle, Maureen, Steve 1, Lynda and Steve 2 – chatting and drinking – just relaxing. Looking out for whales that we saw hurling themselves out of the water. Usually saw Caroline and Rob up there as well lying comfortably on the lounges and reading as they did not go into the pool/spa. Was good of them to look after my gear while I went into the tub. Our first stop off from the ship was at Icy Strait Point, located near the village of Hoonah. We docked at about 3.00pm. The off shore excursion I chose was “Wildlife in Spasski River Valley/Bear Search”. This was a guided nature walk with Robert that trekked through rugged bush country of the Spasski River Valley. We boarded a bus and drove along the street to where we commenced our trek. The vegetation was very spectacular and saw some interesting plant life that Robert pointed out to us and explained what some of them were used for. We came to the viewing spot where two other park rangers joined us. We spent quite some time seeing whether we could see any bears. Those that had binoculars shared them with us and Yes, there were a couple of brown bears – too far away to take a decent photo. Some bald eagles were flying overhead. After about 2½ hours of pleasant easy walking we were back on the bus to go to the village of Hoonah. It has the largest native Tlingit Indian settlement in Alaska with a population of approximately 760 residents. Saw some of the cruise group at another excursion so we had a very quick wave as the bus drove past. Can you see the bears? They are over there !!! I went into the historic Hoonah Cannery building that had the history of the salmon industry that I found extremely interesting . To help one remember some of the main species of the salmon is to use one’s hand: Pinkie ringer = Pink; Ring finger = Silver; Middle finger = King; Pointer finger = Sockeye; Thumb = Chum!! Then it was a short wander back to the ship for dinner. There was only Kay and Phil at our table tonight. Listened to a very pleasant duo – the Forster Duo – and then it was into my cabin after talking to a Perth couple, Chris and Fred for quite some time – they were independent travellers. We were scheduled to sail at 10.00pm. Bed after an interesting day. Up and had breakfast and onto the coach and left Abbotsford for a relatively short drive to Vancouver. We drove through downtown Vancouver. One landmark pointed out was four statues outside the BC Stadium of Terry Fox (July 28, 1958 – June 28, 1981) who was a Canadian athlete. His right leg was amputated in 1977 after he was diagnosed with osteosarcoma. In 1980 with one leg having been amputated, he attempted to run east to west across Canada to raise money and awareness for cancer research. Sadly he died before he was able to complete the run. Was quite exciting when we passed near the Harbour and saw our cruise ship. We arrived at the Port and was able to go on board the Celebrity Millenium. After doing all the formalities for Security, went and had lunch with Gail and Russell (fellow companions). It was then into my room (2072). At 4.30pm along with the majority of passengers, I went up on deck as we slowly sailed out of Coal Harbour, Vancouver. It is a beautiful harbour with the North Shore Mountains in the background. We headed out towards the Lions Gate Bridge – reminded me of the Golden Gate Bridge in San Franscisco but in green. After doing some unpacking and familiarising myself with some of the ship, went and had a dip in the hot tub. At 8.30pm, I went into the Metropolitan Restaurant (5th floor) to my designated table – seated with three pleasant Chinese girls. (Smoked salmon and Creme Brulee.) After dinner had a short visit to the casino and then into my cabin to sort out some shore excursions. Ended up being totally confused and it was 4.00am. Looked out my porthole but it was very foggy and nothing to see. Went down to Level 3 and booked some off-shore excursions and then had breakfast with Raylene, Brian, Sal and Russell. Chatted with Rhonda, Joe and Daniella who I first met in Calgary but are on the other bus of TripaDeal – into bingo, hot tub and then dinner at 8.30pm with Kay, Phil, Sal, Russell, Gail and Margarita. (Escargot, lamb and Creme Brulee). Today was a day of relaxing.